Shop online for over 1,600 accurail model trains at discounts up to 29%. Freight Cars is the most popular of the 3 accurail model trains categories, then Parts, and Roadway. This is the HO Scale 36' Double Sheathed Wood Boxcar w/Steel Roof, Wood Ends, Fishbelly Underframe Undecorated Kit from Accurail. This is the HO Scale Canton Twin Hopper Virginian #5736 from Accurail. These easy-to-build HO Scale plastic car kits feature a one-piece body with details molded in place. 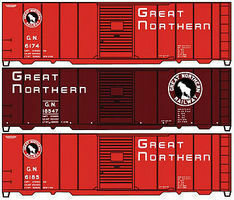 This is the HO Scale 40' Steel Boxcar Great Northern (3) by Accurail. This is the HO Scale Data Only Yellow 40' Plug Door Steel Reefer from Accurail. This is the HO Scale 36' Double Sheathed Wood Boxcar w/Steel Roof, Ends, Fishbelly Underframe Missouri-Kansas-Texas Kit By Accurail. This is the HO Scale 40' Steel Reefer w/Hinged Door - Kit (Plastic) - Data Only (yellow) from Accurail. This is the HO Scale 40' Wood Reefer Kit URTC/Bananas by Accurail. This is the HO Scale Data Only (Black) 50-Ton Offset-Side Twin Hopper from Accurail. This is the HO Scale 36' Fowler Wood Boxcar Data Oxide Red Kit from Accurail. This is the HO Scale Pittsburgh & Lake Erie 50' AAR Riveted Boxcar from Accurail. This is the HO Scale New York Central 40' Swing Door Steel Reefer from Accurail. This is the HO Scale 50' Steel Boxcar Baltimore & Ohio from Accurail. This Package Includes 12 Pairs of Accumate Standard Size Magnetic Couplers Designed & Patented by Accurail for use with your HO Scale Model Trains. This is the 50' Boxcar Floor and Detail Kit HO Scale Model Train Freight Car Accessory by Accurail.